When I was growing up in South Africa and my sport obsession was blossoming, one day specifically stood out in my memory each and every year. On the 16 June (Until 2007) every year I would wake up early and join my parents and watch the start of the greatest challenge to man, the Comrades Marathon. I used to watch the incredible men and woman and dream of competing in the Comrades Marathon myself. A knee injury made me reassess this dream, but this Sunday I will be at the Comrades Marathon for the first time in my life. This is largely thanks to my friends in the Unogwaja Challenge. I thought I could tell you about the moments I saw in my life that made me love the Comrades, from the celebrations of the gladiators that cross the line, to the moments just before and after the gun when the mad scramble was on. From friends carrying friends over the line to people turning around to make sure they help others and the emotional arrival of people cramping in the final straight. The Comrades is the greatest marathon for a reason, for the comradeship, the friendship and the ability in overcoming one of the great challenges in life. When Charl Mattheus won in 1992, he later tested positive for a banned substance and had his reputation in shatters. But the substance in later years was proven to have no performance enhancing effect and an emotional Mattheus won the Comrades on the down run in 1997 to finally get his winners medal and his moment of glory. Stephen Muzhingi, a good friend of All Things Jabu, become the first non-South African winner from Africa in 2009 and then he went on to defend the crown in 2010. In 2011 he did what no one since the great Bruce Fordyce, a man whose name is entangled in Comrades folklore, had done, he won the Marathon for the third consecutive year. 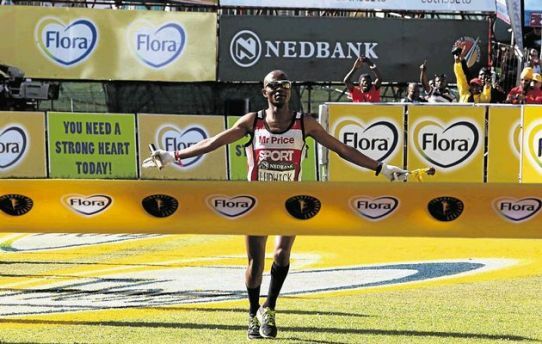 I wrote about it here in All Things Jabu, but this was a monumental year for the Comrades as Ludwick Mamabolo (who has been cleared completely), become the first South African winner in 7 years of the Comrades. 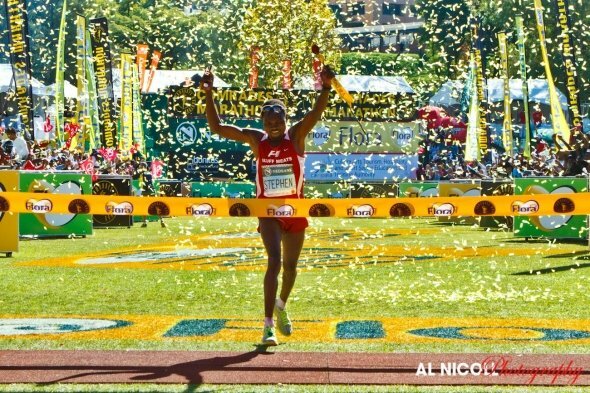 As much as we enjoyed Stephen’s dominance, there is something special about a South African winning the Comrades. Vladimir Kotov from Belarus had lived in South Africa for long enough to be a South African citizen. He was also the double defending up-run champion. In 2004 he won the Comrades and was offered the Mr Price bonus for being the first South African home, he kindly turned it down and handed it to the second South African to pass the finish line. Cult status secured. Zola Budd, the long distance South African that represented Great Britain at the 1984 Olympics, took on a different challenge last year, she took on her first Comrades marathon. She trained with the legendary Bruce Fordyce and completed the marathon in an impressive 8:06. She unfortunately has withdrawn from this year’s event, but I’m pretty sure we will see her again in 2014. In 2013 the quintessential endurance event will add another highlight as I get to experience the glory of the finish and welcome home my friends as they complete the 2013 Unogwaja Challenge. What a great tribute to all of these legends, T. I hope your run on Sunday was a good one. Once again history was made when a South African, our Claude Moshiywa, won the up run for the first time since Jetman in 1992.